The Westphalain Dachsbracke is a small scenthound that was developed to hunt a wide range of prey that includes hare, fox, deer and boar. They specialize in hunting and tracking in mountainous terrain and can also be used as a schweisshund or 'bloodhound', which tracks the bloodtrail of wounded prey. Similar to the taller Deutsche Bracke, the Westphalian Dachsbracke was developed several centuries ago from these larger hounds. It is likely the Dachsund contributed to the bloodline to help shorten their legs. 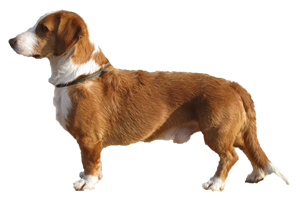 This breed is also the ancestor to the Swedish Drever. The two remain very similar, although the Drever is now far more popular than the Westphalian. Is the Westphalian Dachsbracke Right for You?